BOB BAFFERT stopped short of calling Barry Eisaman, V.M.D., a miracle worker, but the Racing Hall of Fame trainer knows the results that can come from sending a horse to Eisaman Equine Services in Williston, Florida. Barry and Shari live on the farm along with their daughter Kristina, who is an established equestrian and is an undergrad at University of Florida with an animal biology major. Their son Matt is a Captain in the US Air Force specializing in piloting C17 cargo planes. He and his wife, Nichole, reside in South Carolina and have two children, Bailey and Will. The Eisamans also share the farm with their dog, Joy. Dr. Barry and Shari Eisaman co-own Eisaman Equine, a full-service Thoroughbred farm located on 420 acres of central Florida's fertile and tradition-rich training grounds in Williston near Ocala, Florida - the Horse Capital of the World. Their passion and experience in Thoroughbreds spans four decades. The Eisamans specialize in the breaking and training of young Thoroughbred racing prospects, rehabilitation of the Thoroughbred athlete in-training, and pinhooking 2-year-olds.For the past twenty years Eisaman Equine has broken,trained and rehabilitated thoroughbreds for many of America's leading owners, trainers and racing syndicates. A big part of Eisaman Equine are their 2-year-olds-in-training consignments. Barry and Shari acquire as many as 50-70 yearlings annually at various sales, including Keeneland, where they have been ranked among leading buyers by numbers. Those yearlings enter the Eisamans' program where they are developed into their 2-year-old year before reselling as ready-to-race prospects. 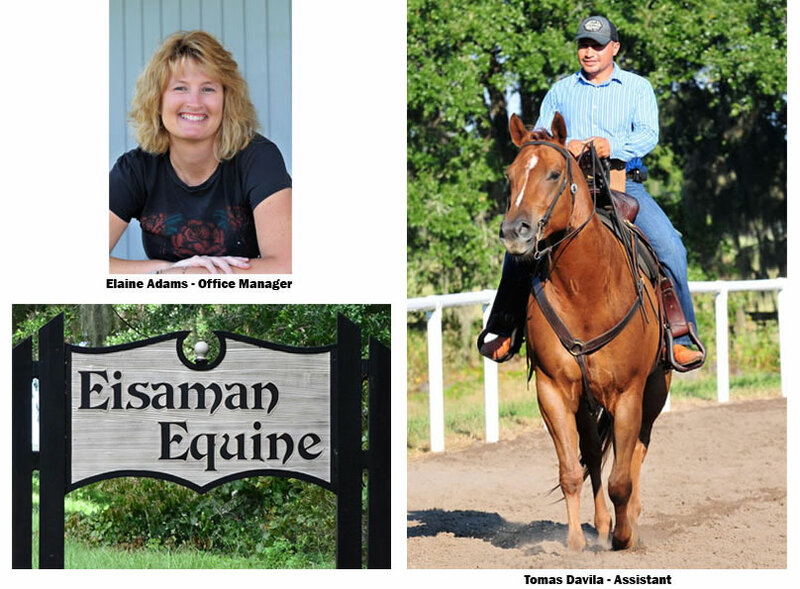 Unlike most agencies, Eisaman Equine only sells 2-year-olds and has made a strong impact doing it, Consistently ending up among leading consignors at the juvenile sales, the Eisamans have sharpened their focus on the 2-year-old markets close to home. 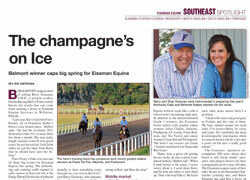 Eisaman Equine is a perennial leading consignor at the Ocala Breeders' Sales Company March Sale. Barry serves as secretary/treasurer on the board of directors at OBS. Barry graduated veterinary school from the University of Pennsylvania in 1976 and has practiced sports medicine in South Florida before moving to Ocala in 1982. The Eisamans, who's facilities support stabling for 260 horses, do have their own broodmare band which consists of over 20 mares that they breed annually in Florida and Kentucky. Some of those mares were fillies they sold as racing prospects and then purchased following their respective racing careers. Their homebreds are also pointed for the 2-year-olds-in-training sales.